Cricket - Parish Cup 2nd round - Mytholmroyd v Thornton. Thornton bowler Bradley Weatherhead. Bradley Weatherhead looks to have bowled Thornton to the brink of their first Spenser Wilson Halifax League title success. He took 7-44 as his side comfortably beat Booth by six wickets in yesterday’s crunch top-of-the-table clash. It widened the gap between the pair to 16 points with four games left and surely dashed Booth’s hopes of being champions for a third successive year. Neither side had been consistent in previous weeks but Thornton came up trumps when it mattered with Weatherhead to the fore. He started by ripping out the Booth top order, leaving the below-strength visitors 17-4. Visiting skipper Richard Laycock (74) shared stands of 95 with Hasnain Wajid (38) and 64 with Usman Saghir (32) before Weatherhead returned to help clear up the last four wickets for the addition of 13 runs. Defending 189, Booth had hope when they claimed the second and third Thornton wickets with the total on 74 but that only brought powerful Josh Hutchinson to the crease and he hit 72 not out in company with Mick Shanks (26 no) to end the contest. 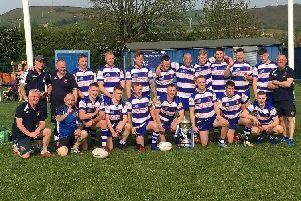 Warley’s wafer-thin title hopes appear to have been ended by a second successive defeat since their Parish Cup final victory. They mustered only 81 at Sowerby St Peter’s with wicket-machine Martin Schofield moving to 72 for the league campaign with 5-42. Amjid Azam hit back with four wickets in reply but Sowerby were not about to let their golden opportunity slip and scrambled home with four wickets to spare. Triangle moved above Warley into third with a 43-run home win over Oxenhope. Middle-order quartet Christian Silkstone (74), Chris Metcalf (60), Carl Fletcher (62) and Josh Graham (44) helped Triangle to 377-9 and that was beyond Oxenhope, although Edward Jackson (83) and Josh Tetley (70) took the chance to boost their averages. Bridgeholme’s relegation, after just one season in the top flight, was sealed by a 67-run defeat at next-to-bottom Southowram. Tom Belfield (49), Dan Pummell (48) and William Darby (44 no) all just missed out on half-centuries for the Rams but a total of 242-6 was out of reach for the Eastwood side. Southowram are still 11 points adrift of Copley, who lost by the minimum margin away to Shelf Northowram Hedge Top after beating the leading two sides in the previous fortnight. Oliver Hemingway (68 no) played a real captain’s innings to give the hosts victory by one wicket in pursuit of their visitors’ 235-9, which featured a 167-run third wicket stand between Oliver Thorpe (72) and Alex Rowles (97). Aamir Rashid took 5-68 and his 31 batting down the order later proved valuable for Hedge Top. Mytholmroyd’s dismal run continued with a 173-run defeat at SBCI and Southowram may feel they have a chance of catching the Moderna Way outfit. Tom Wood (108) and Simon Wood (106) were the stars of the show for SBCI, coming together after the loss of opener Lewis Firth for five and helping their team to 271-5. Oliver Benson then got in on the act with 5-44 as Royd were all out for 98 - two short of a batting point - with Hasan Jamil (35) their top scorer. Scores: Copley 235-9 (A Rowles 97, Thorpe 72, Rashid 5-68), *Shelf Northowram HT 236-9 (Hemingway 68*, Malik 49): pts 5-11. *Southowram 242-6 (Belfield 49, Pummell 48, Darby 44*), Bridgeholme 175: pts 12-3. *SBCI 271-5 (T Wood 108, S Wood 106), Mytholmroyd 98 (O Benson 5-44): pts 12-1. Warley 81 (Schofield 5-42), *Sowerby SP 84-6 (Azam 4-31): pts 1-12. Booth 189 (Ric Laycock 74, Weatherhead 7-44), *Thornton 193-4 (Hutchinson 72*): pts 4-12. *Triangle 377-9 (Silkstone 74, Fletcher 62, Metcalf 60, Graham 44, Dyson 4-147), Oxenhope 334 (Jackson 83, J Tetley 70, Fielden 44, Mawer 41): pts 12-5. Points (after 18): Thornton 189, Booth 173, Triangle 165, Warley 160, Shelf Northowram Hedge Top 130, Sowerby St Peters 129, Oxenhope 127, SBCI 125, Mytholmroyd 120, Copley 115, Southowram 104, Bridgeholme 55.